To sync multiple iPhones on one computer, Apple suggests you to create separate user accounts on the computer for each iPhone, as iTunes is a one owner dog and won't treat the two iPhones equally. However, this way is not that simple and very time-consuming. If you also think that is not so satisfactory, look no further, here is the best place with the best ways to backup multiple iPhones to one computer. How to Sync 2 iPhones to One Computer without Erasing Data? DearMob iPhone Manager, the best iOS data backup and transfer tool, will help sync two iPhones to the same computer without "Remove and Sync" message. You can full backup your 2 iPhones to one computer with encryption, or selectively transfer photos, music, videos, contacts, etc from 2 iPhones to the same computer in separate folders. How to Backup More than One iPhone to Computer with iTunes? The data will never mingle if you use your iTunes in a right way. 1. Please choose different names for each one of your iPhones. 2. In your iTunes, click on Edit and choose Preferences > Devices > check "Prevent iPods, iPhones, and iPads from syncing automatically" > OK.
3. When you connect your second iPhone to iTunes for backup after the first iPhone backup, iTunes will ask you to set up your second iPhone as new iPhone. Choose this option and iTunes will know it is another device so it will create another record. 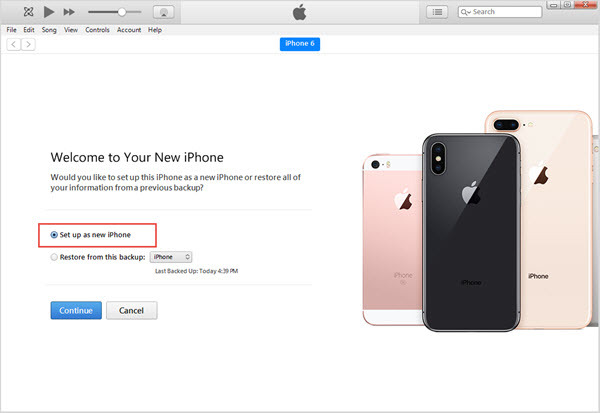 If you accidently choose Restore from this backup, iTunes will restore your iPhone from another iPhone's backup and cover all the data on your second iPhone. If you have done these three jobs, you can backup iPhones with iTunes without any worry. The backup will stay separate and independent in different folders, and no data from one iPhone will merge with the others. How to Backup Two iPhones to One Computer without iTunes? Here, we use DearMob iPhone Manager to help backup multiple iPhones to one computer. 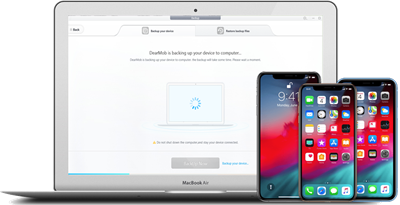 We have selected 2 iPhones with 1 Apple ID and 2 iPhones in two different Apple IDs for backup, and DearMob iPhone Manager backup the iPhones to one computer easily with no data loss and mix. The backups are saved to two different folders that are easy to find for further restore. Step 2. USB connect one of your iPhones to computer, tap "Trust" to continue when there is a popup message on your iPhone. Step 3. On the main interface of DearMob iPhone Manager, click on Backup icon to access the backup window. Hit BackUp Now button to start backing up your iPhone to computer. If you want to encrypt the iPhone backup to safeguard your private data, you can check "Encrypt your Backup" before hitting the BackUp button. Step 4. After the first iPhone backup, connect your second iPhone to computer with USB and then follow the steps as we mentioned above to backup your second iPhone to computer. Good job! Now, you have backed up two iPhones to one computer successfully. Besides the full backup, you can also separately and selectively sync data files from the two iPhones to the same computer with DearMob iPhone Manager. You can transfer photos, music, videos, contacts, messages, etc to the location of your choice on computer at will. Besides, managing your iPhone handset is as easy as ABC.